Mindshare launched a unique interactive campaign with Mallika Dua, as part of Idea 4G #IndiaKaLiveNetwork initiative. The campaign is an attempt to bring alive the experience of video calling with a renowned celebrity in real time. Building on the brand’s tagline of ‘India Ka Live Network’, Idea 4G Live leveraged the power of video calls in an attempt to create awareness about common misdoings of people and encourage them to change their behaviour. 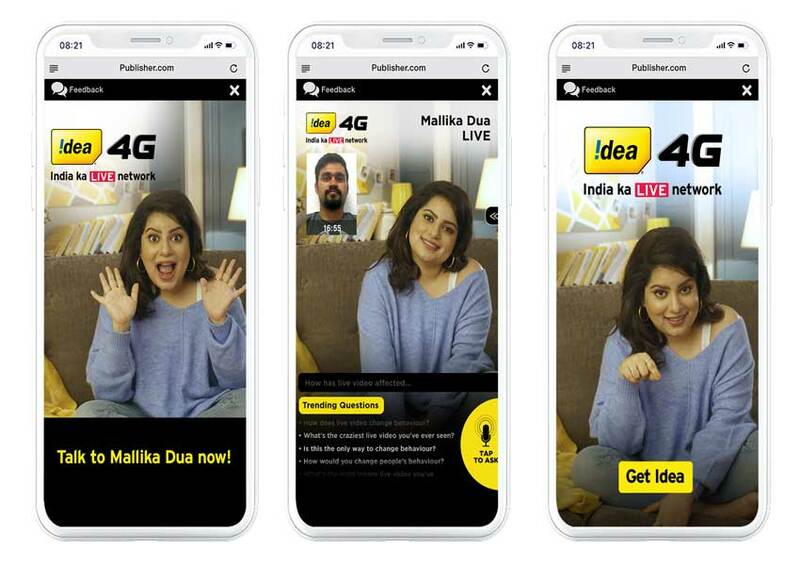 Mindshare and Idea 4G unveiled a distinctive voice-enabled AI led interactive video chat bot ad campaign that enabled millions of users to interview Mallika Dua. This has never been attempted before in the digital mobile ad-space, and was co-created by mCanvas, the experiential storytelling ad platform for small screens. The tool allows users to interact with Mallika, and ask her questions ranging from personal trivia to the benefits of Idea 4G network and the power of live videos by simply tapping on the mic icon. Trending questions are also prompted at the bottom of the screen which the user can scroll through and ask Mallika. The innovation is done through live media banners placed on popular websites, which can be accessed through mobile phone browsers. The experience is designed to be seamless and resemble a live video call with the user’s own face seen on the screen. This experience can last for as long as the user has questions to ask and also allows users to ‘Get Idea’ in just a few clicks. The innovation uses Artificial Intelligence (AI) where the ad creative listens to user questions in English & Hindi and uses Machine Learning (ML) to analyse all the questions asked by previous users and increase accuracy of the responses. For example, if a user asks a question in Hinglish, the AI detects that it contains English and Hindi. Next, the ML helps accurately assign a relevant answer to that question. The campaign is live on several media and news websites and has already seen engagement from over 7.2 million users. The campaign is witnessing about 8 times higher than the average mobile-banner click-through rate. Interactions with this creative have also been found to last for an average of 22 seconds, with some users spending over 10 minutes. Motion Logo of Durgeshgorer Guptodhon unveiled!